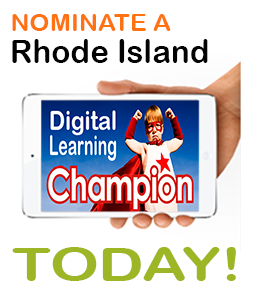 Several virtual and digital learning initiatives are taking place to help us support student-centered learning in Rhode Island. To prepare our students for success in the 21st century, we must change the way we support our teachers and students. To transform education for the 21st century, we need to rethink learning, rethink schools, and take advantage of all of the resources available to us. Rhode Islanders value individualized approaches to learning that provide every student with the opportunities for success. Rhode Island aspires to provide an educational system in which every student is enrolled in rigorous learning environments that meet their individual needs and through which students progress based upon their demonstrated mastery of essential, aligned, and agreed-upon rigorous academic and 21st century skills. Our vision is that starting in early childhood, all students have access to personalized learning experiences that are experiential, blended, flexible, and differentiated; as a result of these experiences, students will be able to control the pace, place, and content of their learning experience. Rhode Island middle and high school students will have access to a wide range of high quality early college and early career training programs that enable them to earn high-value, portable credits and credentials. Rhode Island schools and districts will have systems and opportunities that expand students’ access to personalized learning, and teachers will have the skills needed to enhance personalization in and outside the classroom. Computer Science for Rhode Island (CS4RI) is among the most comprehensive statewide computer science (CS) initiatives in the country. CS4RI takes a coalition approach by combining national leadership with homegrown talent to reduce barriers to providing quality computer science education and professional development, and will bring CS learning opportunities to all Rhode Island schools in the years ahead. Our goal is to have CS taught in every public school by December 2017. AP Computer Science is only offered in only 9 public high schools, and no Title I schools (i.e., schools where at least 40% of a school's students are from low-income families). Only 1% of RI high school students are currently enrolled in CS courses. In 2014, fewer than 350 students graduated from a Rhode Island college/university with a bachelor’s degree in CS, but there are more than 1,000 open CS jobs available in the state. Only 42 Rhode Island public school students took the Computer Science AP test in 2015, less than 1% of the total AP exams taken across the state. Only 26 passed with a score of 3 or higher. Of those students who earned a passing grade, 73.1% were white, and 76.9% were male. This compares with 68.1% white and 41.6%% male for all public school AP test takers. How can technology improve learning to ensure that all students have access to high-quality educational experiences?